How did you first get started in the sport of track and field? What made you so interested in throwing? I started track and field because of my brother: we would always be at the track with him, and one day I watched the practice and seen the throwers; it just seemed to interest me. As a thrower, who has been your biggest inspiration thus far? I think just all of my teammates. Seeing them do so well in national competitions, I wanted to do just as well as they did. You ended off the 2017 outdoor season with personal bests of 9.33m and 27.14m in the shot put and discus, respectively. The following year you had an impressive breakthrough, throwing 12.69m in the shot put and 36.24m in the discus. What training led to such growth in just one year? It was from my coaches Tatum Maclean and Pat Carty, and also from the other sports I do that contributed to the growth in my throws. At this year’s Canadian Legion Track & Field Championships, you captured bronze in both the shot put and the discus with performances of 12.10m and 36.24m, respectively. How did it feel to stand on the podium in your first national championship? It felt amazing to hear my name being called, the medal being put around my neck, and to hear my team cheering in the bleachers. In the discus event at Legions, you threw a four-and-a-half metre personal best to win the bronze medal. Take us through the competition. It was my first national competition so I never experienced that type of competition before…it was a little overwhelming. I hit my PB on my first throw, I think that happened because all my adrenaline and nerves were built up. As I was going up to throw, my team walked over and it got me even more pumped up to throw. After my first throw the rest of them kinda fell off, but the only throw I cared about was my first throw, and right before the competition my coach said I was going to hit that. The next day you competed in the shot put, which went a bit differently for you, not throwing a personal best but still capturing the bronze medal. Take us through the competition. How were your nerves during the event, knowing that you had already won a medal the night before? I wasn’t so much nervous but excited from the day before, I wanted to do just as well that day as the day before. During my shot put event it was the hottest day of the competition and it was mid-day so it was in the middle of all the heat. I think because it was so hot that no one really threw great; that was what some of the other competitors said to me. To start off the competition my throws weren’t great but still in the high 11’s, so my goal for the last three throws was to hit 12m. It wasn’t a PB but still got me a third place finish and it wasn’t until my last throw that I knew I won another medal. The 2019 edition of the Legion Championships will take place in Sydney, Nova Scotia. What goals do you have in mind for your first national championships as a Youth athlete? Are you excited to have the championships take place in your home province? Some goals I have in mind are to just keep improving from this year into the next and try to do good at next year’s nationals. With the competition coming home to Nova Scotia I’m excited, I was hoping to be able to travel somewhere where I haven’t been before for my last two years of Nationals, but now friends and family are able to watch people compete on home turf. 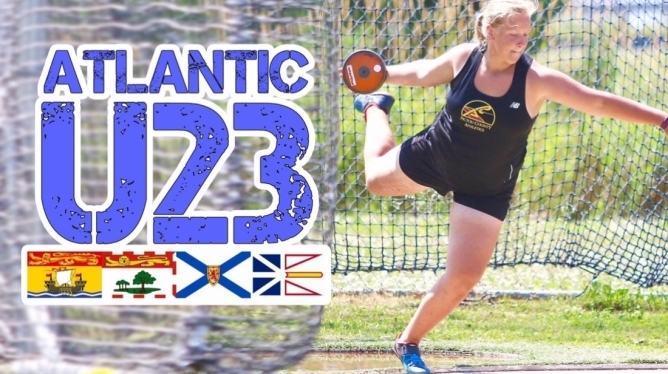 You competed in the hammer throw once this past season, throwing an impressive 32.07m at the Atlantic Track & Field Championships, but did not contest the event at the Legion Championships. Do you plan to add this event to your repertoire in the near future? I’m planning to add hammer into my repertoire, I was going to do it this year but I didn’t have enough practice in it to do it competitively. Having competed in the shot put, discus, hammer throw, and weight throw, the only throwing event you have yet to attempt is the javelin throw. What are your thoughts on trying out the javelin? I did try javelin when I first started throwing but I didn’t enjoy as much as shot put and discus. The Nova Scotia School Athletic Federation (NSSAF) has long been known for its track and field events not matching up with Athletics Canada/IAAF standards. In your case, the Intermediate Girls category (age 14-15 athletes) throw the 4kg shot put instead of the Athletics Canada implement weight of 3kg. What are your thoughts on athletes having to switch between weights depending on the competition? Personally, switching from the 3kg to the 4kg was a little difficult, but going back to the 3kg after throwing the 4kg really helped me. It had me throwing farther than I was in the indoor season because after throwing the heavier weight it felt easier throwing the 3kg. While shot put is an event contested both indoors and out, discus is an event that does not have an indoor equivalent. What do you do for competition during the indoor season? For shot put I still compete indoors at Atlantics, but for discus I just work more on technique since I can’t compete during the winter. Aside from throwing, what are some of your other hobbies? Other than track and field I also play hockey, golf, and soccer.